This week was a very significant moment for me: a few days ago it was the five year anniversary of my gastric bypass. I can’t believe the crazy journey it has been, from losing 100 pounds to learning to eat new foods to getting a degree in health coaching to falling in love with cooking healthier. Case in point: this week I went over to my friend’s apartment and made dinner. 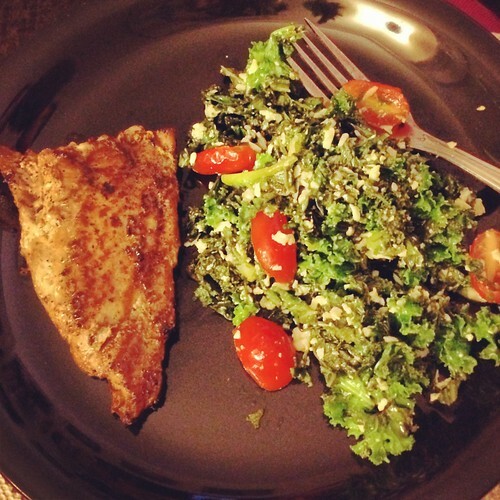 He absolutely loved the mahi-mahi and fresh kale salad with queso blanco that I prepared. I even lucked out because he happened to be in the mood for kale, so I definitely did good. The next thing on my list? Check out some healthy recipes and get to cooking more this year! Here are some ideas that I’m starting with, including a favorite new cookbook. 1. 5 Healthy Snacks That Will Make Kids Smile: Okay, I have to be honest here–I’m not a kid but these adorable snacks from my friend Alejandra Ramos of AlwaysOrderDessert.com made me smile. They’re just SO CUTE and I don’t think you have to have a kid to make these. 2. Vegetarian Quinoa Paella: This recipe from Mexican chef Julian Medina of Toloache NYC was recently shared for Latina.com–and I love it! I actually have tried making a quinoa paella in the past, but it wasn’t vegetarian. I think it’s time I tried again, don’t you? 3. Weeknight Wonders by Ellie Krieger: My friend Justin Schwartz (a cookbook editor & the voice behind JustCookNYC.com) recently gave me this book because he knows how much I love healthy eating–and I’m in love with it! However, with the busy Holiday season and my cookbook shelf being seriously out of order, I had forgotten about the book until I saw her segment on The Today Show. Well, now I’m back to it because, trust me, there’s nothing better than healthy meals that can be made in just 30 minutes! These are some of the recipes I can’t wait to try: ancho chicken salad with jicama, orange and avocado, the Colombian chicken soup with corn, potatoes and plantains, steak fajitas and the mojito mahi-mahi with mango and avocado. Yum! 4. 29 Healthy Versions of Your Favorite Comfort Foods: Spicy chipotle burgers that are actually GOOD for you? Yes, please! Although that’s admittedly the only Latin entry on this list of foods from Buzzfeed, it DOES inspire me to try my hand at some Latin comfort foods in a healthy way. Hmmm yes, that’s what I’d like to do next! 5. Have You Experienced “Gymtimidation”? : One thing that’s constantly on my New Year’s Resolutions is “go to the gym”. Yes, I am a pretty healthy eater and I’m still maintaining my weight loss goals but, to be honest, I know I’d be happier if I had some muscle tone, too. Reading about the very real “gymtimidation”–something which I never even realized I always experienced–has actually given me some ideas on how to conquer the fear of the gym and get back to it. So I’m starting very slowly but I’m definitely hoping that 2014 will be the year that I make exercise a regular habit. Be honest: have you ever experienced “gymtimidation” when working out? This entry was posted in 5 Things Friday, Cookbooks, Snacks, Spanish, Vegetarian, Weight Loss and tagged cookbooks, healthy snacks, paella, quinoa by Irina Gonzalez. Bookmark the permalink. I used to have serious gymtimidation! I didn’t even want to go into a gym to check it out. I was about 45 pounds heavier when I first joined about 5 years ago and was terrified of all the judgement and what I’d look like to everyone else who was there. But after the first 2 sessions I realized that on the whole, no one actually pays attention to anyone else. They are all too busy working out, too! It helps that we have a big range of shapes, sizes and ages, but after getting over that original fear, I’ve never looked back. I’ve been going an average of 3 times a week since then and feel so much better for it! Oh wow! Interesting to see that it’s a much more common phenomenon than we realize. I’m REALLY hoping to get over my own gymtimidation issues this year….